One gripe: I'll bet the whole issue doesn't mention us, a site that's been around since 1996. Meanwhile, we've been front paged in the San Francisco Chronicle and written up in U.S. News & World Report, Entertainment Weekly, ... on the Sci-Fi Channel ... and linked off a Yahoo! portal. Read the first part of the entertainment weekly thing, What did they do on the Sci-Fi Channel? The BFFC has been on the front page of the San Francisco chronicle? That's pretty cool! Ah now I remember reading that article here a while back. It must have been really cool having Bulloch come to your birthday! Oh yea i was reading issue #98 and saw that the next issue would be this one....you beat me to the punch once again Aaron.....for the last time, MWAHAHAHAHA!!!! ah yes i saw this but haven't had chance to report it, this will be issue #75 in the UK, out on 15/01/08. Cant wait!!!!! Don't forget there's also going to be a special "Previews" edition version of this one coming out with it's own different cover. I finally broke down and got a new scanner, so I'll scan a pic from the Previews magazine the first chance I get. I'm glad I already subscribe, I haven't gotten mine yet, but I'll be happy when I do! I didn't know this was the next one coming. Valthonin and Ninjax, next time, beat me to the punch by e-mailing me as soon as you know. It's better to reach me with timely news than post to the boards. Sadriel, once you get that scanner, I hope to have the image galleries back up to par. Just for you. The wife picked me up a newsstand version today at Barnes and Noble, so they're out if anyone wants to run out and get one. Looks really good, so far. Haven't had a chance to read through a lot, just mainly browse real quick. Looks really sharp. Lots more pics of the white proto-type armor than the ones they showed in the "Aurra Sing: Dawn of the Bounty Hunters" book. They also show what the rest of the bounty hunter statues from Kotobukiya are going to look like. Very nice, indeed. Even though it was released in December, do you think it's still out??? Definitely. I asked the wife last night, and she said they still have some on the shelves. They won't get rid of them until the new ones come out next month. Yeah, I found it at Barnes & Nobles on Friday! 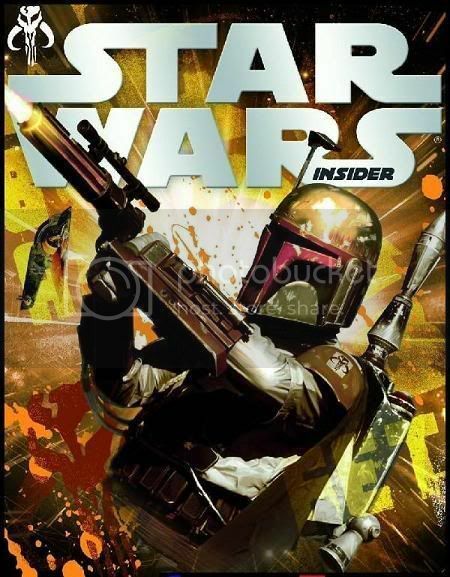 <3 I've skimmed through it and it's very interesting, plus there's some nice images of Boba I've never seen before. So i've had to go skimming the net for pics of the new bounty hunter statue's, 4-lom & Bossk are the pics i've been able to find. Could someone shed some light on this, if you know? I knew there was going to be a "Previews" edition cover of this magazine, but I'm getting two different versions of what it looks like. This is the cover that was originally shown in the Previews Magazine. However, this is the one I picked up from the comic shop today and what is being sold on eBay as the Previews edition cover. Has anyone heard or seen anything different? Thanks. Just got the new Star Wars.com email yesterday. Either the email is very late, or they put out the online suppliment really late, considering that issue #100 has been out for a month now. 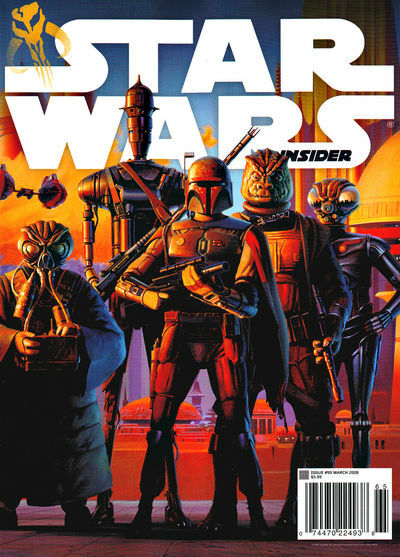 Anyway, the new Online Suppliment for Star Wars Insider #99 is out with lots more Boba, Jango, and other bounty hunter stuff in there for you to look through. The only drawback is that you need a Hyperspace account to access it. So, if you don't, sorry. If you do, then enjoy. You know, I'm sitting here finally reading through all these articles that are in the Online suppliment, and I have to say, I'm pretty annoyed. Don't get me wrong. There is a lot of great stuff in there. Especially the article on the old 1979 13-inch Boba Fett figure toy and all the prototype pics of the how it was originally supposed to look like, alaong with all the spring loaded missile pack, wrist darts, and LED lights in the chest (that's something I never knew). It's that there are several other Boba Fett and Mandalorian fan clubs mentioned in the articles, and not once, so far, have I seen anything that mentions us at all. I'm sorry, but that's pretty jacked up. That just leaves a bad taste in my mouth, you know? Sorry, just kind of pisses me off, is all. By the way, here are some pics of the Prototype Fett figure from the Star Wars Collector's Database. You don't need Hyperspace Access to see these sites, so enjoy.